In the early stages of DISC training, one of the most important things that students of behavioral analysis learn is that people are “predictably different.” In other words, everyone has their own unique personality, one that was developed through years of experiences, relationships, and events. Yet, even though at a glance we’re all different from one another, our personality traits represent commonly repeated patterns. These patterns of behavior can be easily categorized into one of the four DISC personality types. The highs and lows of a DISC chart can be excellent predictors of behavior. We may all be different, but DISC helps us understand our similarities, too. The high point of the DISC chart is a predictor of how anyone with a similar high point might respond in a specific situation. For example, in a crisis, anyone categorized as a dominant D can be counted on to be decisive. The intuitive I will naturally want to talk through a problem. Steady S will be patient and dependable. The calculating C will be a thorough and logical problem solver. They’re all different responses to crisis, yet immediately predictable based on the DISC chart and a working knowledge of DISC theory. Of course, there will be many times in life when being able to predict someone’s behavior would be incredibly valuable. Who do you turn to when you need relationship advice? (I) Who do you turn to when you need help making a decision? (D) Who would be the hardest to charm with personality alone? (C) Who is the least likely to respond well to direct confrontation? (S) But, DISC personality tests aren’t always available to you. Sure, it’d be great if every time you met a new person they were required to hand you a copy of their DISC assessment. Sadly, it’s not usually that easy. 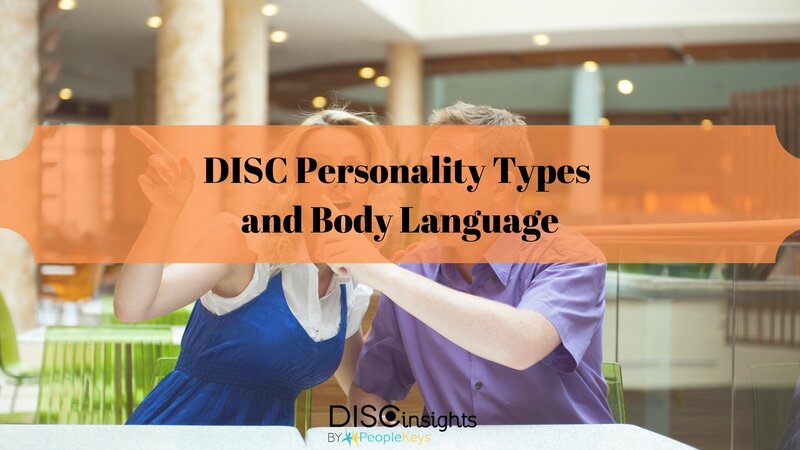 Most of the time, it will be up to you to guess the DISC personality type of the person you’re dealing with. Fortunately, determining an individual’s personality type isn’t very difficult if you know what to look for. What follows are five specific indicators of personality style that take the guesswork out of DISC identification. When engaged in a conversation, pay attention to the speed of a person’s dialogue. Does the person you’re talking with speak quickly or slowly? Fast talkers will likely be a D or an I. Slow talkers will likely be an S or a C.
Observe the way a person moves. Do they walk quickly? Do they make fast or large gestures with their hands? Do they walk slowly and make minimal gestures? A faster mover and big gesturer will likely be a D or an I-style. A slower mover will likely be an S or a C.
Look at a person’s posture and the way they carry themselves. Do they sit forward or lean back in their chair? Are they generally intense and alert or relaxed? Intense and alert posture will likely be a D or an I. Relaxed posture will likely be an S or a C.
Determine whether or not a person appears decisive or quick to act. Are they fast to make a decision, or slow. Do they take charge, or look for the opinions of others? Individuals that are quick to make a decision or take action will likely be a D-style. People that are less focused on the decision and more focused on the feelings of people around them is likely an I-style. People concerned with group consensus or involving others in the decision is likely an S-style. A slow decider, who wants to think it through and examine the details first is likely a C-style. Think about the subject of discussion. Does the person talk about tasks and tangible topics? Do they discuss people in their life, gossip, and more abstract topics? Someone who focuses on tasks is likely to be a D or a C.
C will focus on the specific details or process. Someone who focuses on people is likely to be an I or an S-style. An I-style tends to be quite good-humored in their relation to others. An S can have a tendency towards the serious or a focus on personal relationships within their immediate circle. Understanding an individual’s personality style gives you greater insight into how to communicate more effectively. This can apply to friendly conversation, confrontation or conflict resolution, counseling, relationships with clients, real estate transactions, business negotiation, and more. Want to know how your customer thinks? Personality style can also be translated into a buying style. In the arena of sales, this technique is referred to as behavioral selling.